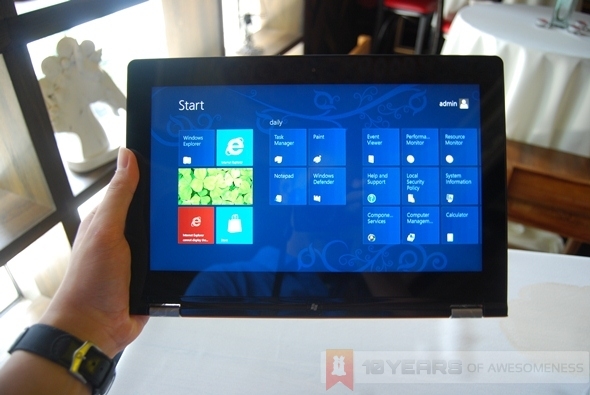 As the flagship Windows 8 consumer device from Lenovo, there’s only one word to describe the new IdeaPad Yoga 13: it’s cool. 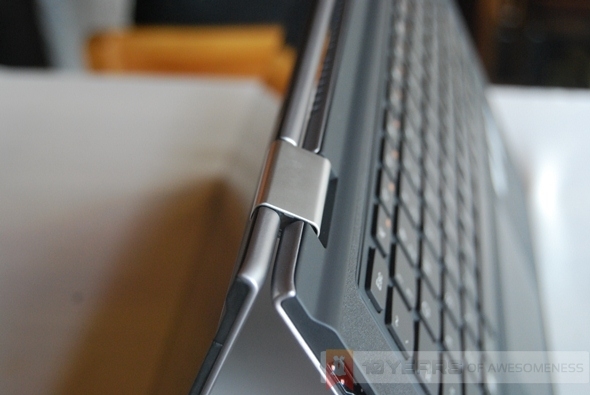 With its unique hinge design that allows for the Yoga 13 to be used in four different modes, it is no surprise that this was one Ultrabook many have been looking out for. 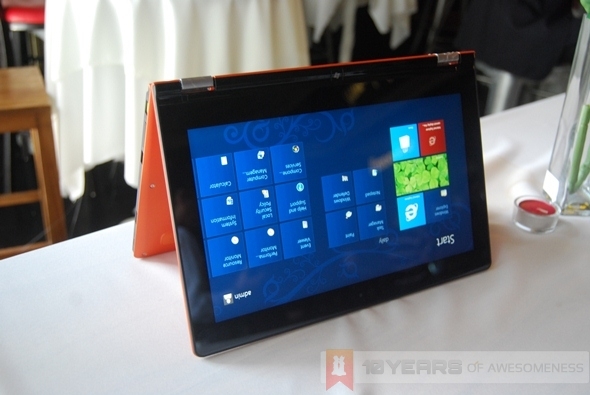 The Yoga 13 and Yoga 11 are both similar on the outside, with the same external design as well as materials. They even have the same colour options (Clementine Orange & Silver Grey). However, on the inside, things are wildly different. 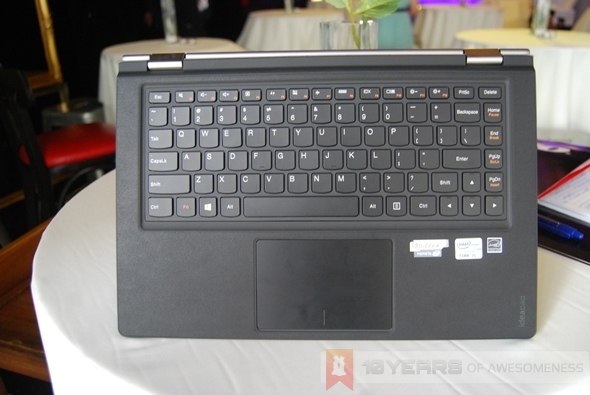 The Yoga 13 is powered by a 3rd generation Intel Core i processor and 4GB of RAM. Besides the 13.3-inch IPS screen (which looks brilliant, by the way), this 1.54kg Ultrabook as two USB ports (1 USB 3.0) as well as a HDMI out port. Those with deep pockets can even opt for up to 256GB of flash storage and 8GB of RAM. The 4-cell battery is also slated for eight hours of use. 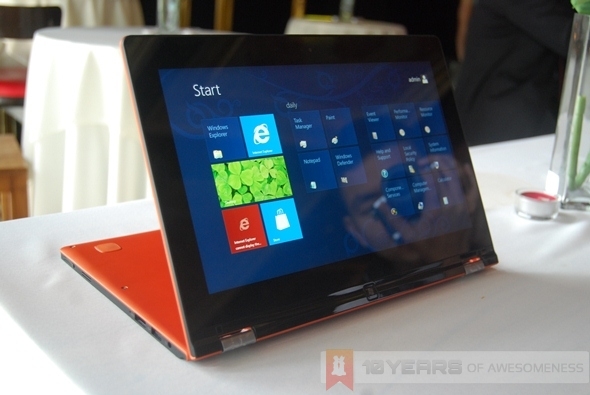 The Yoga 11, on the other hand, weighs a fraction less at 1.27kg. 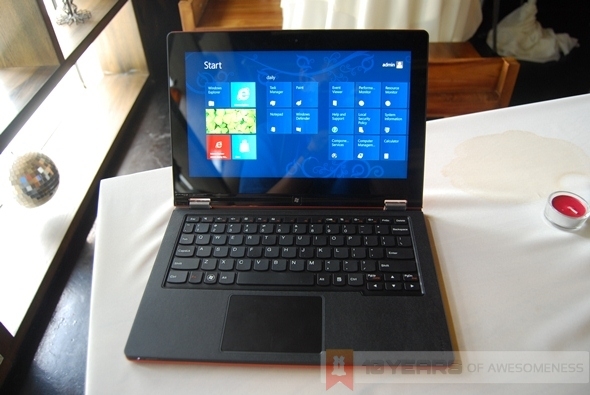 Running on Windows 8 RT, the Yoga 11 is powered by an NVIDIA Tegra T30 processor and 2GB RAM. 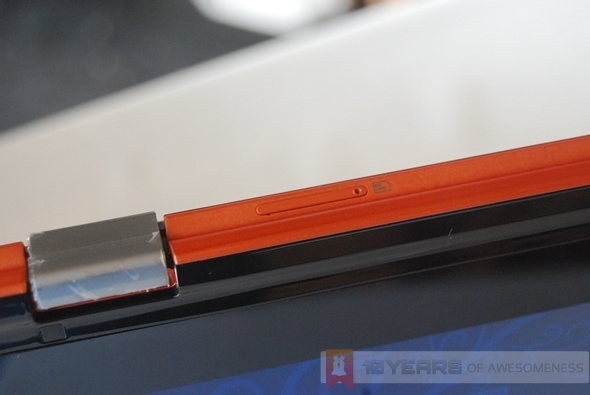 It also has two USB 2.0 ports, a 2-in-1 card reader as well as a HDMI out port. There’s even integrated Bluetooth and WiFi connectivity, in addition to a SIM card slot (though it’s not listed on the official brochure, so we’re not sure what type of SIM card does it support). 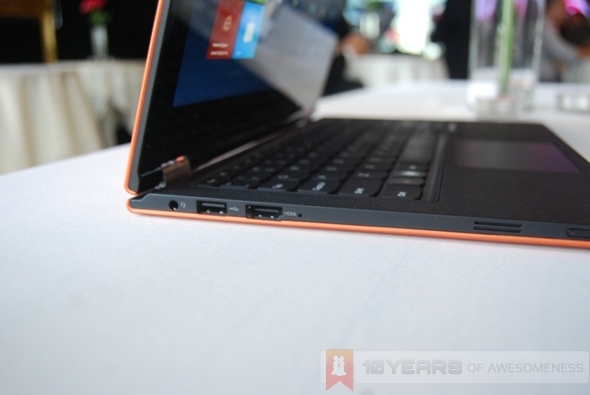 Finally, depending on configuration, the Yoga 11 has up to 64GB of flash storage. 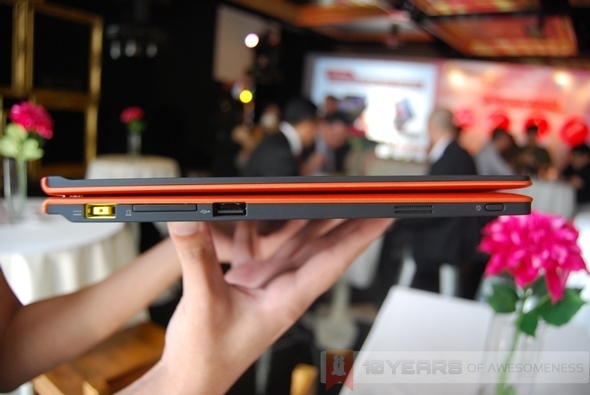 The four modes that Lenovo are touting here, while pretty cool, are essentially just two: Laptop Mode and Tablet Mode. Both the Stand and Tent Modes can be accomplished with a tablet casing for normal tablets, so for us those two are more of a marketing tool than anything else. 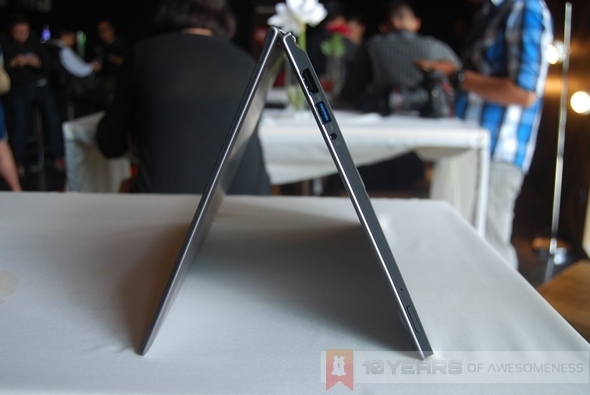 As an Ultrabook, the Yoga shines due to the weight of both devices as well as classic Lenovo durability. 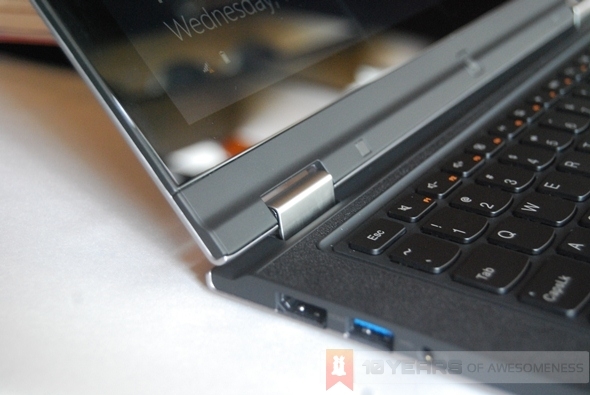 The unique two-stage hinge, we were told, has been rotated 25000 times in Lenovo’s labs to ensure that they last for the life of the product. Lenovo’s AccuType keyboard is present too, making typing a joy with its pillowy keys (although the key layout requires plenty of getting used to). 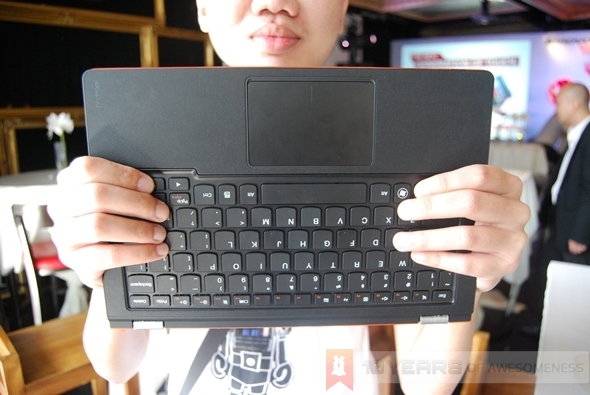 Unfortunately, having a screen that flips 360 degrees into Tablet Mode does make it very awkward right from the start: the user’s hands would be gripping the keyboard at the back, which 1) is not comfortable, and 2) might even damage the keyboard. We did notice that once the Yoga detects it is in Tablet Mode, it switches off the keyboard and touchpad inputs. When we asked, we were also told that there would be a special cover for the keyboard that would be included with every Yoga purchase that users can put on prior to using the Yoga in Tablet Mode. It also must be said that the weight and dimensions of the Yoga 13 makes it rather uncomfortable for long term use as a tablet. 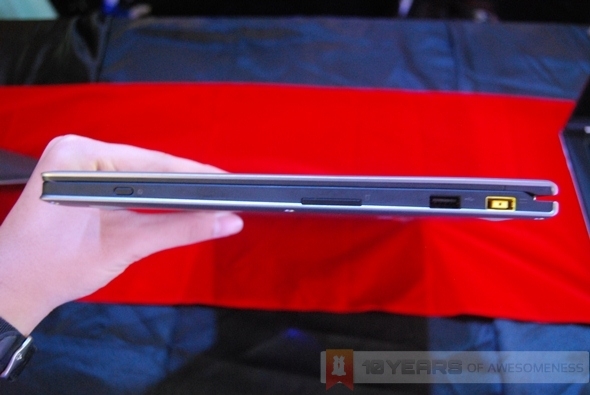 The Yoga 11, on the other hand, fits the hand better due to its smaller screen size. However, it would be a while yet before we can get more in depth with both Yogas, given that the Yoga 11 would only be available next month, and the Yoga 13 at the end of the year.